Written by: Scott Harper, WSU Plant Pathology; Teah Smith, Zirkle Fruit Company; Rob Curtiss, Washington Tree Fruit Research Commission. February 2019. 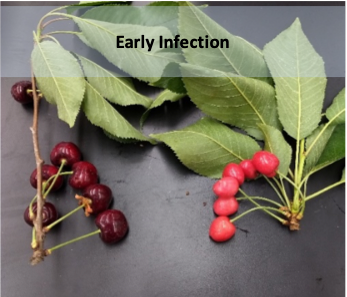 Little Cherry Disease is caused by Western X Phytoplasma as well as Little cherry virus 1 (LChV1) and Little cherry virus 2 (LChV2). Diseased trees produce cherries of small size and poor color and flavor making the fruit unmarketable. 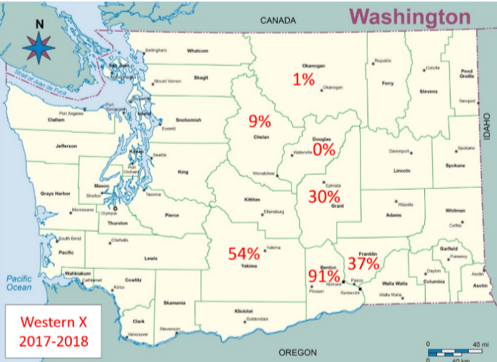 Western X is at epidemic levels in the Columbia River basin, with high incidence from Yakima, Benton, and Franklin counties, and present in Oregon around Hood River. Western X is not a new problem. It was first identified in cherry trees of WA State in 1946. In a 1947 survey, about 1% of cherry trees were found to be infected, and it has remained present ever since, fluctuating in frequency. Early infection (Year 1), small fruit may be restricted to one branch, or cluster, fruit color may develop normally, or individual pale to white fruit may be observed. Middle infection (Years 2-3), systemically infected tree, small fruit observed on multiple or all limbs, and poor color development is pronounced. 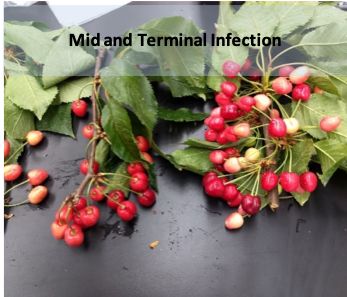 Terminal infection (4+ years), cultivar dependent, but characterized by reduced fruit yield, and dieback of limbs. Western X is not a virus, but instead is a type of wall-less bacteria known as a phytoplasma. The Western X phytoplasma lives and replicates in the in the vascular phloem of infected trees, interfering with tree growth and development. Western X is present across North America, throughout Washington State, and at epidemic levels in the Columbia River basin, with high incidence from Yakima, Benton, and Franklin counties, and present in Oregon around Hood River. Western X: Most Prunus species, ex. cherries, peaches, nectarines, almonds, plums, and chokecherry. Infects weeds: ex. puncture vine, tumble mustard, and flixweed. Grafting: Western X is readily transmitted by all types of grafting; other means of spread are not known. Vector: Leafhoppers. Known vectors: Colladonus montanus, Fiebriella florii, Scaphytopius acutus, Paraphlepsius irroratus, Colladonus reductus, Colladonus geminatus. The Western X phytoplasma replicates in the phloem tissue of the tree. 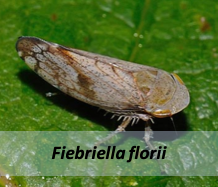 It is believed that the phytoplasma either ceases to replicate or dies in the aerial parts of the tree as the branches go dormant during the winter months, but active, living phytoplasma cells overwinter in the roots. In the spring, the aerial portions of the tree become re-infected as the phytoplasma moves up the phloem of the tree, usually following the same general route as in the previous year. As a result, you may see symptoms in one limb for a year or more, but symptoms will eventually appear in additional limbs. Removing a symptomatic limb does not eliminate the phytoplasma since it is already in the root system before symptoms appear. If you are intending to conduct molecular testing for Western X, the type of tissue you would need to submit changes depending on the time of year – because the pathogen moves as the plant grows and develops. 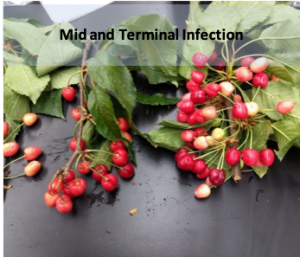 If you are observing what looks like little cherry disease symptoms on the tree, or limbs of a tree, and want to confirm what you are seeing: submit four to six-inch cuttings from the diseased limb, including leaves and if possible, fruit and/or the peduncle (fruit stem). Pre-dormancy: Fully expanded leaves (before leaf drop) (4-5 leaves each). All samples should be collected and placed in a Ziploc bag and kept in a cooler or refrigerator until you can send them to a lab. If mailing or couriering plant samples, please place a cooler pack in with the samples to keep them in good condition. The contact for the lab is Tina Vasile (509) 786-9382 http://cpcnw.wsu.edu/virus-diagnostic-lab/. Drop the samples off at Prosser or send them overnight mail in a Styrofoam shipping container with an icepack. Be sure to include your name and contact information with the package. Avoid sending samples on Thursday or Friday. Check with the lab for details on current fees. Pathogen-Free Planting Sources: Replacement trees must be obtained from pathogen-free planting stock. Nursery trees can be free of symptoms and still be infected. Manage your risks – if in doubt, have the material tested before you buy or plant. Identify and Remove Infected Trees: Primary control measures rely on identification and removal of infected trees. Infected trees spread the pathogen to neighboring trees by insect vectors or via root-grafting from tree to tree. To determine if root-grafting has occurred, treat stumps of removed trees with herbicide and look for herbicide injury on neighboring trees. In an early study, orchards where infected trees were removed as soon as they were observed, the disease incidence remained below 2% and decreased over time. 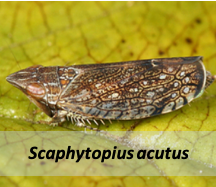 Spray Vectors: Leafhoppers may be present as early as February and as late as November, so insecticides must be applied throughout the season, including postharvest. 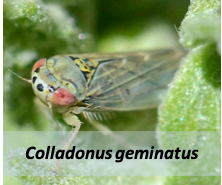 Most leafhoppers feed on multiple host species so suppression of their populations is critical. Avoid indiscriminate sprays. Target the early and late season. 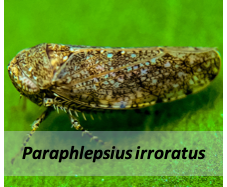 It helps to identify which leafhopper you have present so that you can eliminate one spray if possible. Manage alternative hosts of the phytoplasma and of the leafhoppers: clovers, dandelions, curly dock, bitter cherry, chokecherry. 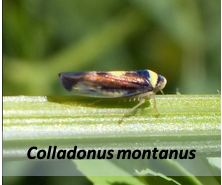 Broadleaf weeds are difficult to eliminate from an orchard but by suppressing them, your orchard becomes less attractive to the leafhopper vectors. Finally, control of this disease requires a community-wide effort, what your neighbor does or doesn’t do, affects you (and vice versa). The key to ending the current Western X epidemic relies on reducing the amount of pathogen present in the state. 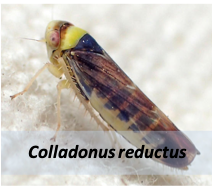 This can only be done by removing infected trees because it is from those trees that the leafhoppers are acquiring and spreading the pathogen.